One of the agents of Naija’s most popular sports betting company, NairaBet has terminated his own life over his inability to pay customer’s winning. 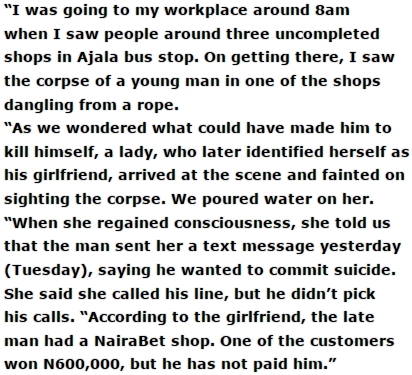 The unidentified agent was said to have killed himself in an uncompleted shop at Ajala bus stop off Lagos-Abeokuta Expressway in the early hours of yesterday when he couldn’t pay a customer his N600,000 winning. 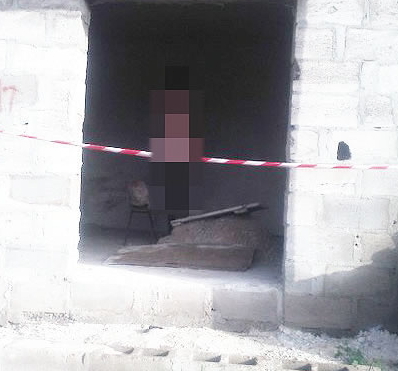 He allegedly used a rope to tie himself to the ceiling of an uncompleted shop in the area. @Johnson.. U must be an under age boy for saying that, do you know the meaning of debt? Though I neva support him committing suicide bt be reasonable next time you want to comment. Very harse judgement by the agent, anyway rest where you belong. @Inspector d guy is more dan stupid,read d post again and see wat dey said dat he spent customer’s winning,cos d mega office has transferd d money into d agent’s account and he made u off d money but couldn’t pay d customer so johnson said it all plz.